All you wavies or curlies that use a low-poo read on to find reviews on some of the available low poo options. So without further ado TW Tales presents THE POO REVIEW by Solidgold! Since starting the Curly Girl (CG) method in May 2009, I’ve been searching for a low poo that does great things for my hair at a low price. Before going CG, I would only wash my hair about once a week because it was so dry. Of course, this was due to years of sulfate-silicone cycle of washing and styling. To take better care of my hair, I tried conditioner-only washing, but my hair didn’t “feel” clean and tended to get weighed down, and being a “wavy”, I felt like I needed a low poo to get that clean feeling. In June, I bought small sizes of Jessicurl’s Hair Cleansing Cream (HCC) and Gentle Lather Shampoo (GLS) to test out the CG gentler cleansers (available at jessicurl.com and naturallycurly.com’s Curl Mart). This review is not about them, but these cleansers are the standards to which I compare all other CG cleansers. The search has been ongoing ever since to find the low poo that meets my criteria of 1) reasonable cost, 2) easy availability, and 3) providing the best results for my hair (thick, medium/fine texture, normal porosity). I recently discovered that the panthenol, a moisturizing ingredient (also known as B5) found in many beauty products, may contribute to over conditioning and limpness in my hair. Jessicurl’s GLS contains panthenol, but GLS remains one of my favorite cleansers. I will review some low poos with panthenol in it, but I am searching for a low poo comparable to GLS without panthenol. Ingredients: Water, Sodium Methyl Cocoyl Taurate, Cocamidopropyl Betaine, Sodium Lauryl Glucose Carboxylate, Glycerin, Lauryl Glucoside, PE G-150 Pentaerythrityl tetrastearate, PE G-6 Capric/Caprylic Glycerides, Laureth 4,Hydroxypropyltrimonium Honey, Panthenol, Matricaria Recuitita (Chamomile) Flower Camellia Sinensis (Green Tea) Leaf Extract, Sambucus Nigra (Elder) Flower Water, Quaternium-79 Hydrolyzed Silk Protein, Sodium Chloride (Dead Sea Salt), Anthemis Nobilis (Chamomile) Oil, Citrus Aurantium (Neroli) Oil, Citrus Aurantium (Petitgrain) Oil, Brown Rice (Oryza Sativa) Powder, Guar Hydroxypropyltrimonium Chloride, Phenoxyethanol, Caprylyl Glycol, Disodium EDTA,Tocopheryl Acetate. This low poo was very runny. It looks like water as it came out of the container, which made it difficult to hold in my hand as I applied it to my hair. On the positive side, I thought is smelled like a classic strong shampoo, which was pleasing to me as it evoked positive hair memories. It lathered lightly, but it made my hair squeak as I washed and rinsed, which made me think it stripped my hair of essential moisture. Even after conditioning, rinsing, applying styling products, and plopping, my hair still squeaked. I gave this low poo three tries, and I don’t think it is worth the cost for the mediocre impression it left. It is also only available online, so when you factor in shipping, it really doesn’ meet any of my criteria mentioned above. This low poo was difficult to squeeze out of the bottle. It seemed thicker than regular low poo, reminding me a little of aloe vera gel: jiggly. It had a light lather and pleasant shampoo scent, but I could hear a little squeaking after rinsing. I gave this product two tries. 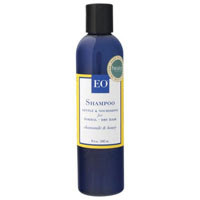 I felt my hair was a little limp after styling, which I attribute to the panthenol in it. The price is reasonable, and this product is available on the ground, so I would recommend it based on price, but I didn’t love it enough to buy more. I find EO C&H to come grea tout of the bottle. It's very runny or watery, in my opinion. At the present , it is my favorite lo poo. I think it does a great job of moisturizing my hair.